Ahmad Hussein laughed. He was teasing Abbas, but when a boy was as full of sorrow as this one, perhaps teasing could help. 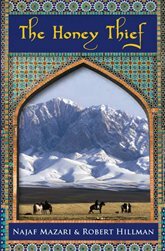 The mystery and wonder of Afghanistan comes to life in these tales of men who converse with bees and bears; of horseshoe bats in flights that blot out the sun, and of blackbirds that bring golden apples to earth from heaven. The sorrow of this extraordinary land is here too in the story of Abdul Kaliq, the king-killer, who ends his life on a scaffold in Kabul, and of Majid the Madman who turns to music for solace when his children die of plague. Other tales tell of an aged wolf who proves to a shepherd boy that he is the most intelligent creature on earth; of Proud Nadia, courted with a copy of Huckleberry Finn; and of the master poisoner Nightfall, who creates a cookbook of enchantments. Whether the tale is of wolves or wizards, The Honey Thief conveys in writing of surprising tenderness what it is like to grow up in a land of bloodshed and brotherhood, of miracles and catastrophes.